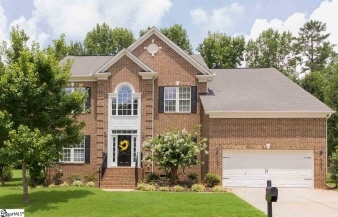 Beautiful one-owner 5-bedroom home, plus office or even a 6th bedroom, in the popular Travelers Rest Woodland Creek community. The Woodland Creek community is off State Park Road and is in an incredible location - only about 2 miles from downtown Travelers Rest and the Swamp Rabbit Trail, only about 4 miles from Furman and 5 miles from Paris Mountain State Park, and just about 10 miles from downtown Greenville. This two-story home has a functional and bright, open kitchen featuring white granite counters, white marble backsplash, Kitchenaid gas range and refrigerator, and a large gourmet island with seating for 4. Light floods into the kitchen through the adjoining sunroom which can serve as a sitting area for afternoon coffee or a stunning dining room. Other 1st floor features include a cozy family room with gas fireplace and built-in bookshelves, a formal dining room, living room and study, which can serve as first floor guest quarters. Make an appointment to see this home today.